So we all know I’m not really talking about meat here but after all of the press about pink slime I don’t want to us the works “taco filling” because that sounds too much like filler, BLECK! I’m talking about seasoning up nutrient dense quinoa. If you’ve read my blog for long you know I’m a fan of quinoa. I buy a big bag at Costco for under $10. I like to use it anywhere someone would typically use ground beef so, burgers, tacos, nacho’s, and my husband LOVES it with cinnamon for breakfast (think oatmeal style). I’ve also used it in place of rice or other grains. It is also a gluten free food for those so inclined. Stir all seasonings into quinoa. We like a lot of spice so feel free to pair this down if you’re not crazy about a lot of seasoning. Stir in tomato sauce, I happened to be out so I used about 2 tsp of tomato paste and a little water. If seasonings are not mixing well add a little water or veggie broth. Last night we had this on Nachos and my three teenagers, or as I usually say teenyboppers, loved it. Other places to eat this would obviously be tacos, burritos, and taco salads. I think for lunch I’ll have some on a baked potato as inspired by Laura’s Taco Potatoes over at Heavenly Homemakers. Of course her recipe has meat but I was still inspired, especially since I still have some fresh salsa and pinto beans to add to my hot potato. Another favorite way to make this is to mix it 1:1 with cooked lentils. I love lentils in place of tradition ground beef recipes. I was planning on cooking it that way last night but alas I forgot to cook the lentils. I know they cook very quickly but since my big kids are here I’d rather visit than cook (or have an extra pan to wash). 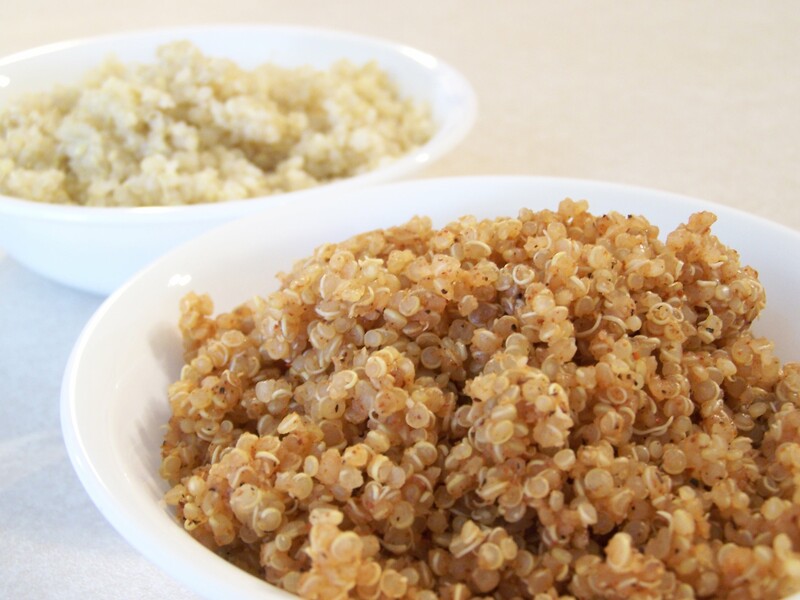 Do you eat quinoa? What is your favorite way to eat it? Since we love Mexican food almost any new thing I try has Mexican flare, I know I should branch out but it’s hard to resist those familiar spices. I love quinoa! What a great way to use it! Very clever. I love the simplicity. What a great idea! I love quinoa. I recently used it in black bean burgers. I will have to give this idea a try! I’ve used quinoa in burgers too but I have yet to make the perfect burger. I just made this for the first time, and it is to die for! All 3 of my very picky children LOVED it too! This is the newest addition to my must have staples. Thank you for sharing it. That made my day! Thank you! 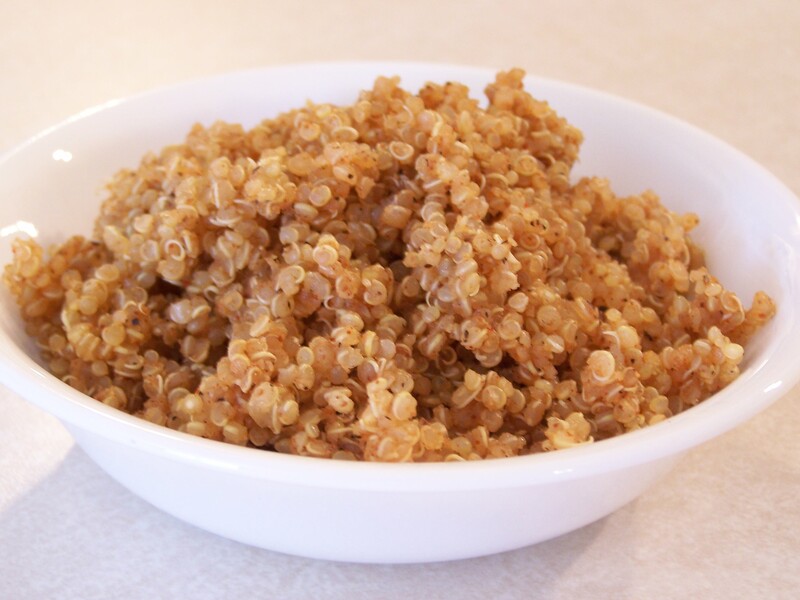 We always have quinoa on hand so it is so quick and easy to make! I’m glad your kids loved it! Holly, I love this recipe! I have used it several times now. We are avid Mexican food eaters, at least twice a week and hubs and I were really looking for a meat free option that didn’t leave you feeling like you’d missed out and this one delivers! Even our kids like it, they’ll mix it in with their ground turkey but I have high hopes that one day it’ll stand alone as our only “meat” option. Delish! I feel like it makes a great stand in for taco meat in a variety of meals like Taco Salad and Taco Potatoes. I try to vary our menu but I could eat Mexican food every day! We had foster kids for a long while. The youngest of the first set we had LOVED quinoa and would just eat and eat it like crazy which was a good thing because I couldn’t get her to eat any meat except the occasional hotdog (I know, not really meat either!)! She was about 10 months old. Then we had a set of 4 siblings, 3 of the 4 preferred the quinoa taco meat recipe to real taco meat! They even asked for it for dinner! I’m going to have to try it with the lentils next time! We’re trying to really stick to a strictly plant based diet and I love your site! Thank you for the various recipes so we don’t get bored! My kids love quinoa too! I prefer the Quinoa-Lentil blend myself but both are really good! I’m glad that you enjoy my recipes. Have you tried the banana bread yet? It’s soooo good! And thank you for fostering! Blessings! Made this for dinner, the spice blend was perfect! Not overpowering, and gives the quinoa a nice flavor that was complementary to everything else in our veggie tacos. Thank you for sharing! Is the “1/2” on the cumin and black pepper supposed to be a 1/2 tsp? Yes, Brodie. It is supposed to be 1/2 a tsp. Thank you for bringing it to my attention. I’ll get it fixed.